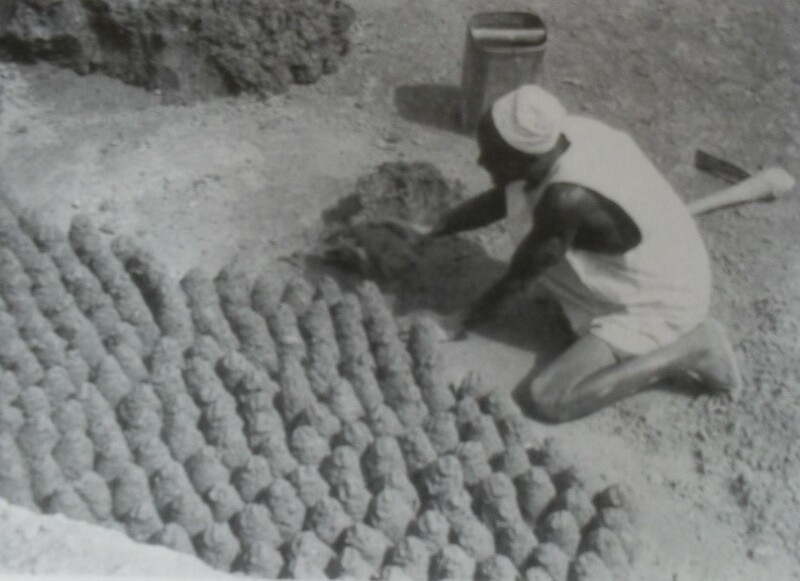 Birji is earth used to make tubali and mortar. It dug out from the kududdufi, the burrow pit carefully chosen by the builder since the birji varies considerably from town to town and even from pit to pit. It is birth from the pit in large lumps hard enough to resist a fall of one metre. 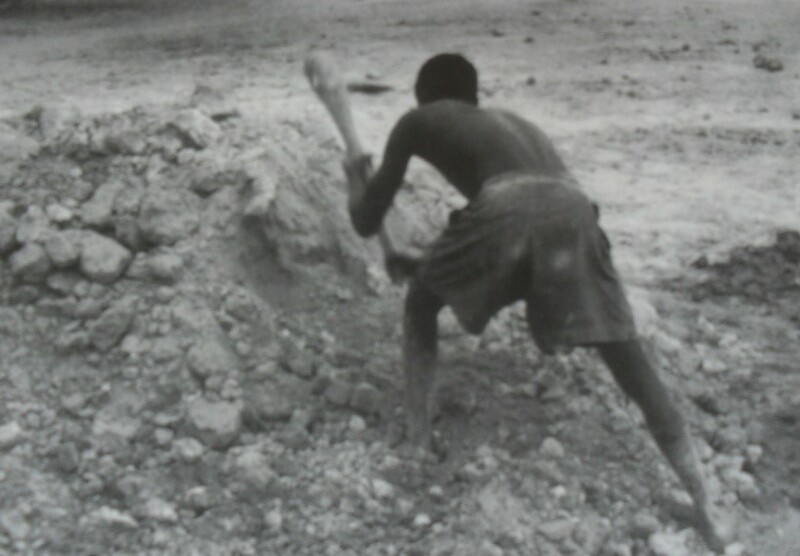 The birji is first broken into small particles with shovel. From then on the processing is quite different depending on whether it is to be used for tubali, mortar or plaster. The broken birji is wetted, spread flat and trampled by foot until it reaches the consistency of thick paste. It is left for a couple of days to dry and then wetted and trampled again before being formed into tubali. The actual manufacture of tubali occupies three men: a carrier who brings the material, a small boy who makes churi and the tubali maker himself. The churi maker sits on the ground with a heap of wet birji he takes a lump of thirty centimetres in diameter, rolls it twice towards him squeezes it from both sides into a solid loaf and throws churi formed to the tubali maker. 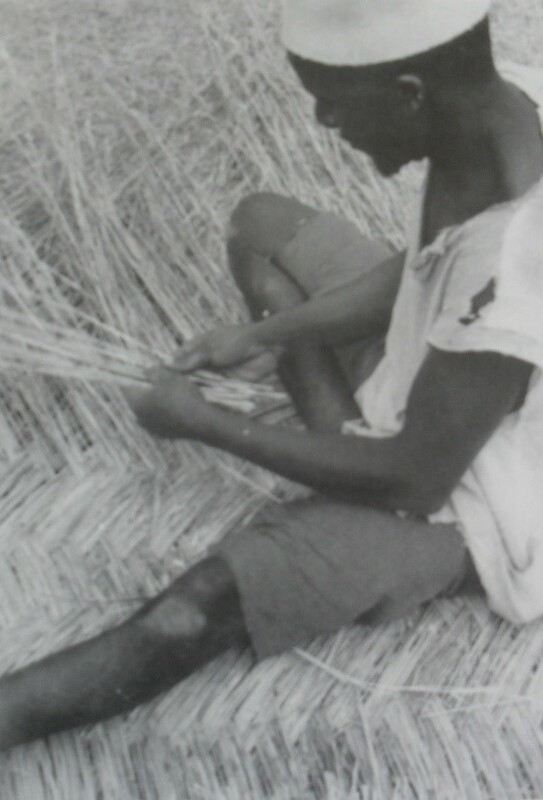 He then begins by rolling the churi on the ground using fine sand to prevent sticking he then shapes his material first into a cylinder then into a double cone, thick in the centre and pointed at both ends. This he lifts in both hands about half a meter from the ground and then throws it down with one hand in such a way that one of the pointed ends flattens against the earth. The particles of the birji adjust themselves during this short moment of impact and about two weeks later when the tubali are dry the particles will be immobilized in this position thus almost pre stressed. Tubali were mostly conical but other shapes were used. Mortar is prepared from the same birji as the tubali only the process of breaking, wetting, tramping, and drying is repeated more than twice. It is a common practice to add horse manure and leave for three days adding water every day. This repeated four times for over a period of two to three weeks. Plaster is generally used for covering walls and is made from birji and the fluid makuba which is made from the fruit pods of the locust bean tree. The best timber used in the north is obtained from the trunk of the male palm tree locally called deleb or gingiya (Borassus flabellifer). The outermost layer of the tree is extremely hard, in contrast to the softer centre. It is sliced into narrow rods lengthwise and radially towards the centre of the trunk. These timbers commonly called azara (izara in Katsina and kyemmi in Sokoto). They are heavy and so rigid that they remain unpalatable to termites, and resistant to decay for many years. Their uses are wide –ranging. They serve as a wooden reinforcement, strengthening the structure of walls and pillars of loam; they make sophisticated frame constructions, beams, brackets and corbels; they create a framework within arch like structures; and they serve as elements carrying flat and domed roofs. 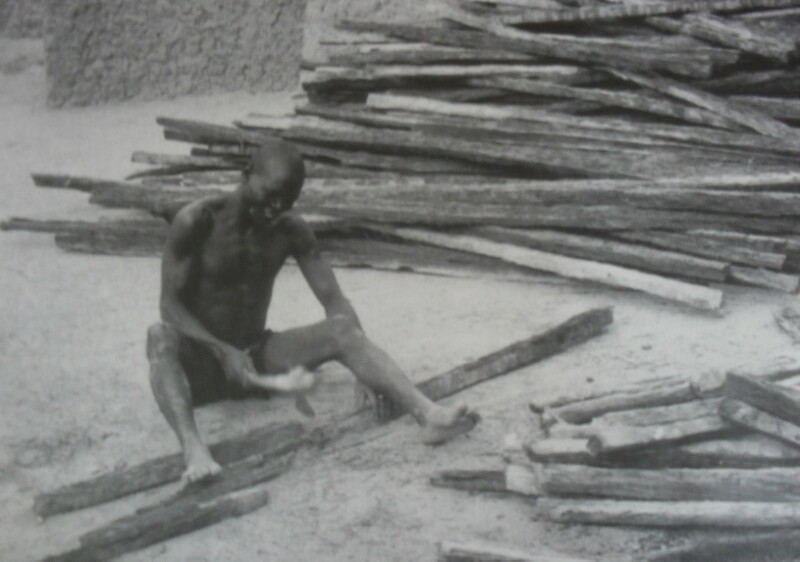 Kirya and goriba (dum palm) wood is used in Katsina to make planks. In Borno, goriba wood is used constructionally. Hard planks are made of kawo (afzelia Africana), of kainya of kaiwa-‘ebony’ tree (diospyros mespiliformis). The most popular roofing material is gongola,, the mid ribs of the tukuruwa palm (raphia vinifera), reaching ten metres or more in length. They are orange in colour, turning brownish-grey with age and have a pleasant, eggshell aheen. The fronds of palm trees provide various materials for various building purposes. The fronds of the giginya palm, were especially favoured. They were used fir thatch, and the leaf-veins of the young fronda provide good fibre for binding. Ropes of great strength were produced from twisted bark of the roots of dakwora (acacia Senegal). Strong ropes, kista, were also produced from the inner layer of the bark of the kuka (baobab) tree. For binding the rafters of grass-hoofed houses, the extremely tough stems of the fara geza (combretum micranthum) were used. The ashes of timber were often used as insulating layer spread on top of flat roofs, and infusions from pods or roots served as water proofing materials. Cornstalks and reeds are commonly used building materials. The roofs of buildings made of cornstalks and reefs were supported on forked poles, frequently made from saplings, or the stems of kasfiya or cham trees. 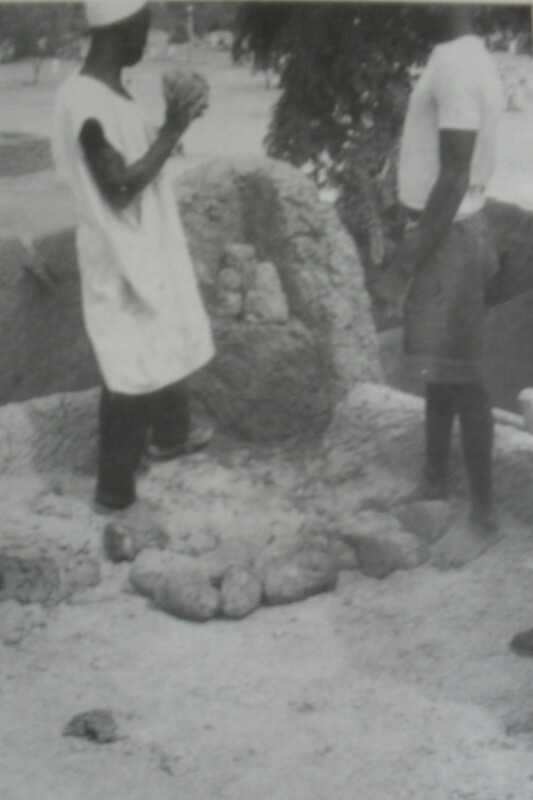 Stone wasn’t often used for building in Nigeria. But the Hausa used it in building town walls and bridges. Rough stones were also used for foundations of loam structures and sometimes as walling material for houses and fences. Iron ore was found two or three metres down and to get it, wells were dug to the ore levels and then extended sideways as the ore was excavated. Huge furnaces of clay about two metres high were built on site and charged with alternate layers of ore and wood charcoal. The most impressive Hausa iron products were the city gates, made of long strips of hammered metal joined together on sturdy frames and set on pivots instead of hinges. Apart from that, iron was used for complementary items, mostly nails. Some nails were cast with decorated heads and were used in rails of outer doors of houses. 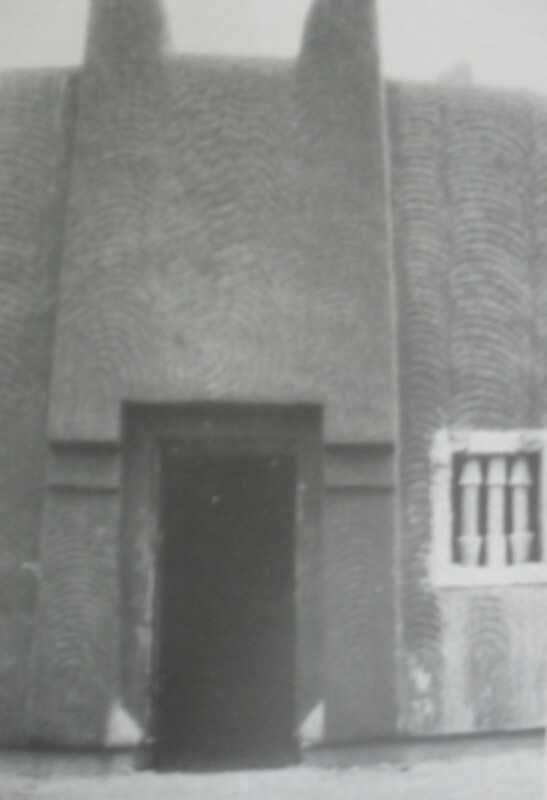 The walls of most Hausa buildings were built on foundations. The depth and thickness of this foundation varied in proportion to the dimensions of the walls to be placed on them. Foundations were either of tubali or stone and depending on the size of the project may require the expertise of specialists. 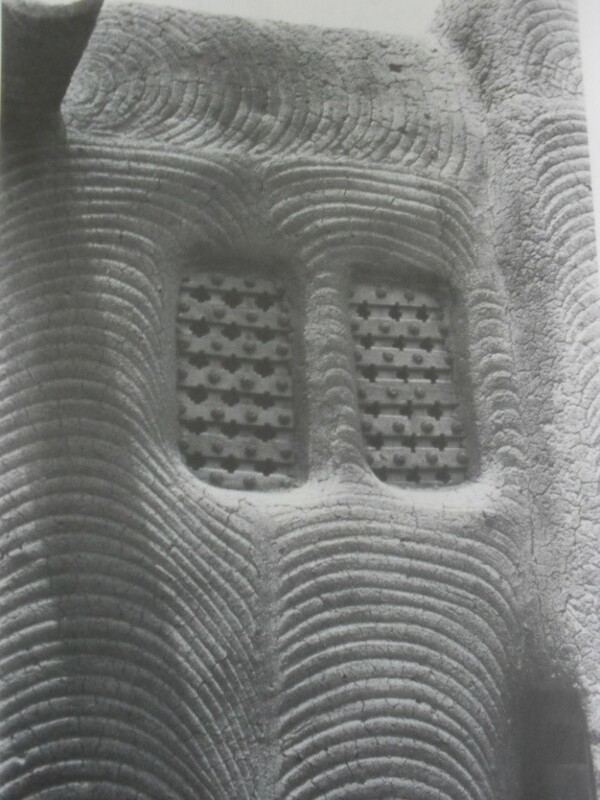 The walls were laid with the tubali laid close together and an inverted tubali used to fill any gaps especially at the corners. All voids were filled with earthen plaster thus creating an extremely thorough end result. 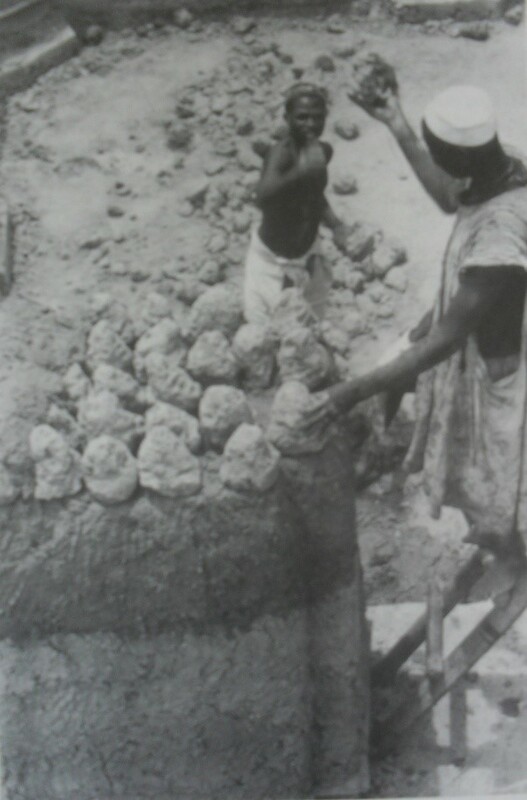 Plaster was applied on the internal tubali of the wall first by using a horizontal force to push it inside. When this was properly done and dried, the outer layers where then covered with plaster. In large building where cost was not a major consideration, horizontal bracings made from azara grids were set in the walls for extra strength. The walls decreased in thickness upwards making them well tapered and thus increasing their structural stability. Buttresses were sometimes employed as additional support to the walls and a parapet crowned the wall at roof level. This parapet was sometimes emphasized with finials at the corners. 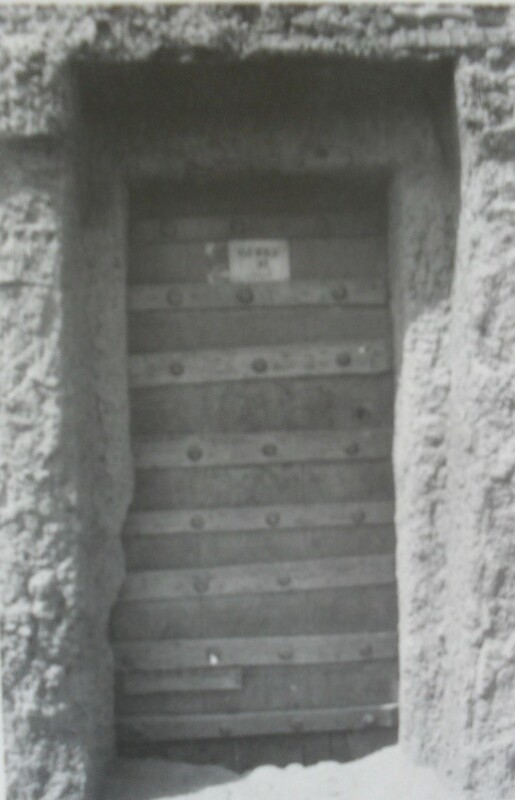 Doorways in Hausa building were usually of two types; outer doorways with wooden or iron doors on a pivot and inner doorways which were door less and usually covered with braided grass curtains. The use of lintels, beams, brackets and corbels were common in the design of the doorway. These were simple openings usually on the uppermost part of the wall on the lee side of the building less affected by the driving rain. Despite their small sizes, they admitted quite enough light and air for lighting and ventilation. These windows sometimes had lattice work made of thin boards giving it an arabesque or grid design. Floors were usually laid by women. A surface of laterite about 3 centimetres thick was laid on a layer of beaten earth. Sometimes building earth was mixed with gravel watered and then beaten down. After this, powdered locust bean pods were spread over the floor and water was poured over it. 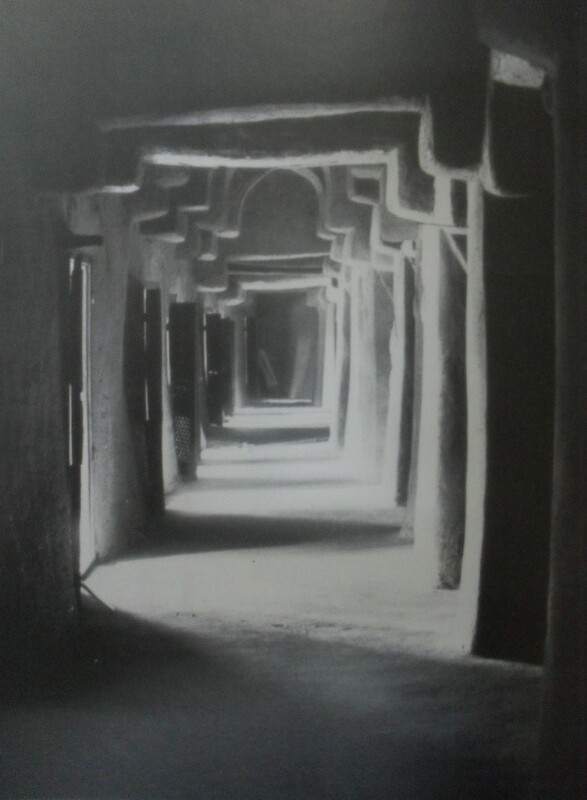 As a rule, pillars had a similar internal structure as the walls. These pillars were either square or cross shaped at cross section depending on its use. Bsc. (Arch) thesis Ahmadu Bello University, Zaria. 1986.